Just a few weeks ago, LG unveiled a supercharged version of its G6 flagship, dubbed the G6+, which doesn't skimp on extra features. 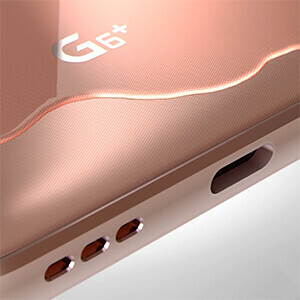 Unlike the regular G6, which either lacked wireless charging or a Hi-Fi DAC depending on the region where you bought it, the G6+ features both of these in one and the same device. There're also a pair of B&O Play earbuds coming along with the device. It also comes in two new colors - Optical Marine Blue and Optical Terra Gold. On top of that, it still features IP68 water resistance, meaning you can theoretically submerge the device up to 1 meter underwater for up to 30 minutes and it will emerge unscathed from the whole ordeal. Aside from these changes, the G6+ is basically the same device with the very same internals, but with one major change - the G6+ comes with some 6GB of RAM, whereas the G6 only has 4 gigabytes of the stuff. The device will be launched in South Korea this month though the pricing and further availability are yet to be revealed. "Aside from these changes, the G6 is basically the same device with the very same internals" So that means the LG G6 Plus will still have the Snapdragon 821 instead of the 835? LG shooting itself in the foot once again. There is nothing wrong with the SD 821. It is very fast. Plus there was no mention of the new LG G6+ also doubling it's storage as well. Jesus LG... F F F F F Fk!!! why no 835!!???!!!!>>>???!!!! MImix already had SD821,6 gig of ram, 256GB storage and bezels bigger screen yeah not 18:9 still 16:9, but bigger 6.4 inch and price right now even cheaper than G6 32GB. So lg should sell G6 with same price as MIMix since MIMix still has more storage than G6 plus. No. the camera not that good, but overall excellent phone. The Mix's screen aspect ratio is 17:9 not 16:9. As much as I like the Mi Mix, its availability is horrible. EBay??.. Are u referring to compatible bands? 18:9 of the LG G6 is sweet, if you like smaller phones you really have to try it. It's a game changer in terms of handling. Mimix is ungainly for everyday use. Its too gargantuan. I've used the phone for a few days before selling it. Phone is just too big and the sound from the piezoelectric speaker sounds odd. It's a big a... phone, but perform very well to be honest. Wireless charging & 6gb ram, that's what I have been waiting for, I would prefer the newer processor, but this is the only phone I can buy. The Samsung s8 stupid finger placement & the onePlus 5 4k Non stabilization have stopped me from considering them. People don't realize that there's no reason for LG to put a new processor because the V30 is going to come out in less than 4 months, considering the time the V20 came out.